Hi Infarrantly Creative fans. 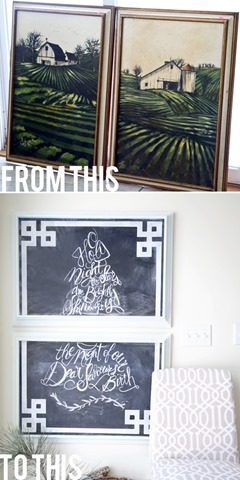 I’m Sarah from Sarah M. Dorsey Designs and I’m back to share a simple way to personalize your walls for little $$! This past Saturday, I went to Goodwill and found these framed paintings for only $5 each. Readily available at thrift stores, they are perfect to transform and make your own! Since mine had a sturdy wood back, I decided to make a pair of chalk boards for my entry.